GIAAC has released the year end rankings for 2016 performed by Guernsey qualified athletes. 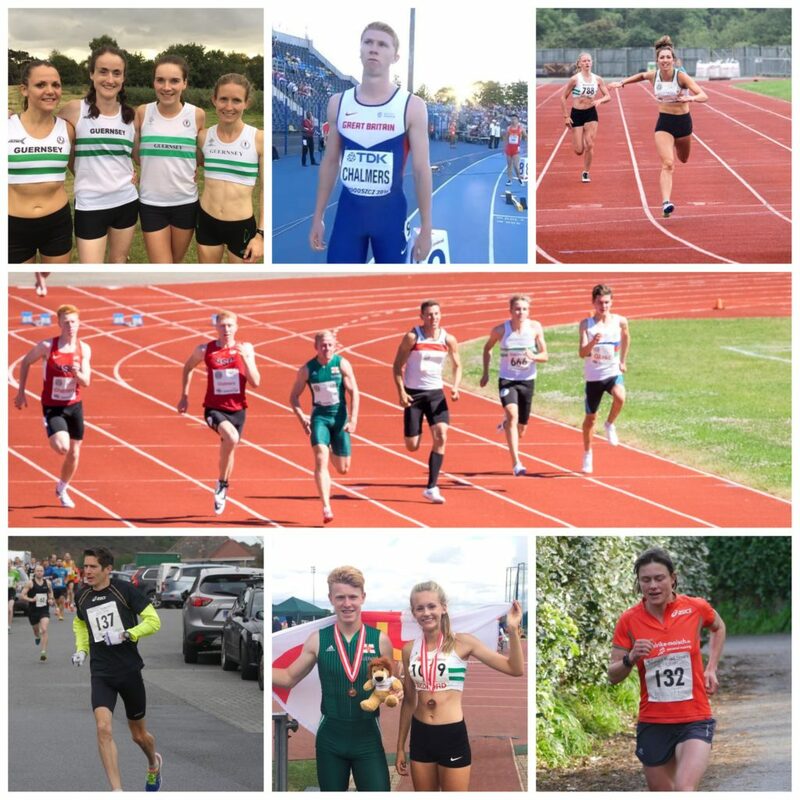 In recent years the best performances often come in the ‘island games year’ but this year saw three Guernsey athletes gain GB selection to major championships. Lee Merrien(European Champs, half marathon), Cameron Chalmers(IAAF World U20 Champs, 400m) and Alastair Chalmers(European U18 Champs, 400mH). Ed Mason also achieved the Euro U18 2000mSC qualifying standard. The event rankings cover the top 15 known performances at open(senior) level for all recognised Championship events and standard Road Race distances. Junior performances are included if they make top 15. Full tables can be downloaded at bottom of post. Without wanting to pre-empt any year-end awards it will be difficult to look past Cameron Chalmers as Guernsey’s athlete of 2016. He amassed a succession of University and Age group titles and finished 2016 as Europe’s fastest teenager over 400m courtesy of his 46.51 second run in the world Junior championship semi final. He is also Guernsey’s fastest ever teenager over 100m and Guernsey’s fastest man of the year with his 10.77 second run over 100m. Domestic women’s sprinting has really taken off over the last two years with some great local battles. Indi Gallagher posted the fastest 100m (12.67) and 400m(58.71) times but Hannah Lesbirel was the fastest 200m runner with 25.85 seconds and seems to be homing in on Jay Peet’s 22 year old island record of 25.3. In between these distances Sophie Porter arguably posted the performance of the season with her English School’s 5th placing over 300m in 40.33 seconds – an outright island record. Porter also shone over the long hurdles with a national age group bronze over 300mH. Ala Chalmers finished a clear GB no1 U17 over the 400mH event and gained U18 GB selection to the inaugural Euro Youth Championships, Chalmers’ demolition of his elder brothers under 17 400m flat record almost went unnoticed. A lot of promise but Sam Wallbridge, who like Cam Chalmers will move into senior ranks next year, still topped the 400mH rankings with his Southern Area U20 title winning run of 54.45. Ed Mason narrowly failed in his own bid for Euro selection, his target being the Euro U18 2000SC, but the 17 year old was nonetheless the fastest Sarnian runner over 1500m, 3000SC and 5000m. Matt Loveridge reduced his personal best to top the 800m rankings with 1m55.05. After recuperating from injury most of the summer Nat Whitty’s season seemed to only last 3 weeks but in that time she posted the top ranking times over 800m 1500m & 3000m. Whitty’s excellent 8th placing in the CAU/AAA 1500m in 4:28.22 being the pick of the runs. Ulrike Maisch was first woman home in both the major on-island long distance races and topped the Half Marathon and Marathon rankings. Her 2:56:49 Guernsey Marathon winning run being within a couple of minutes of Nikki Neal’s outright record. On the track Louise Perrio topped both the 5000m & 10,000m rankings. Mike Wilesmith won both the Milk Run Half Marathon and Guernsey Marathon and courtesy of those runs places second behind Merrien in Half Marathon and Marathon rankings. Mainland based Gemma Tingay continues to improve over the throws and was lead performer in three of the throwing disciplines. Competing for Bristol and West AC she only narrowly missed her own 43.03M Javelin record with a 42.57 throw. She hurled PB’s in both Discus(34.97) and Hammer(29.00). James Bougourd edges nearer the top of Guernsey’s all time Javelin list in improving his distance to 57.33m. Javelin produced one of the sporting highlights of the year with a superb national level competition taking place at Footes lane within the Intertrust Games. The All-Comers javelin record was edged forward in successive throws by Matti Mortimore(Ipswich) & Greg Millar(Birchfield) . Millar’s 71m12cm throw sits 5th on the 2016 UK list but on the day was eclipsed by National no 1 Mortimore with 73m89cm. The experienced Jon Guille was again the leading horizontal jumper with 13.82 triple and 6.42 long but the high jump rankings were remarkably topped by 14 year old Joe Chadwick, who came away from Bedford’s National U15 Champs with a 1.80M clearance and a bronze medal. Alice Hunt, another 14 year old, made a massive improvement in all the jumps and was Guernsey’s top high jumper(1m56) and Triple Jumper(10m42). Sophie Porter’s 5m33 was the furthest long jump by a Guernsey woman for a number of years and puts her in 4th place on Guernsey’s all-time list.